Westwards you will find the majestic Dordogne river, your gate to the the Corrèze and it's numerous leisure opportunities. Eastwards the view from the cottage's lands embrace the Monts du Cantal and is an invitation to discover the authentic Auvergne and the legendary hospitality of it's people. We invite you to spend your holidays in an authentic and comfortable self-catering holiday cottage (gite rural). Our cottage has been awarded three stars by the Gites de France and enjoys a privileged location. 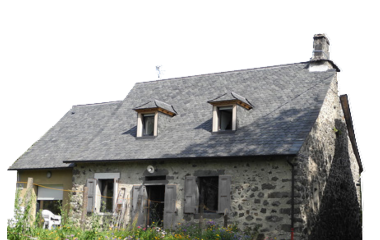 Nested in a hamlet on the plateau of Mauriac, you will enjoy a clear view of the Monts du Cantal (Puy Mary). 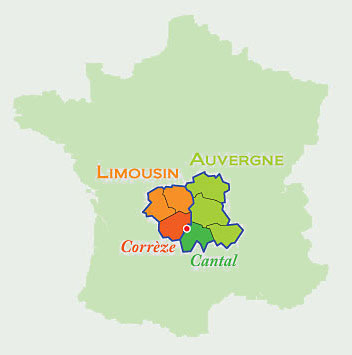 Located very close to the Dordogne it is an ideal base to explore the Cantal (Auvergne region) and the Correze (Limousin region), two departments and two regions known for their authentic and unspoilt nature. To create this cottage we renovated a farmhouse dating from 1828 respecting its noble elements such as beams, stonewalls and monumental fireplace. We have added modern equipment with discretion and without sacrificing comfort. The decor recalls the rural origins of the house without falling into the trap of rustic commonplace. The cottage is situated in a quiet hamlet, surrounded by meadows and woods, offering occupants a much-sought peace. Two villages, located 2 km away, offer the basic services. The town of Mauriac, at a distance of 11 km, has all the modern shops and services. In the surrounding hamlets you will meet farmers and craftsmen that take pride in their skills and are ready to share them with you. We offer you a complete guide with all the good addresses we have collected ourselves. The rich gastronomic traditions of the Auvergne and Limousin regions will overwhelm you whatever the season of your stay. Whether commodity, that for some you can pick yourself, such as chestnuts, blackberries or mushrooms, locally manufactured products, such as the AOC Salers cheese, where one producer is 3 Km the hamlet, or regional dishes that you can buy in shops around or enjoy the many restaurants nearby. Whether you enjoy hiking, fishing or cycling, if you're a fan of old stones, picturesque villages and authentic lands, if you enjoy vast open spaces or prefer to relax in the shade of an ancient country, this place will fill you with fun and memories. Ideally located between Cantal and Corrèze, our cottage is the perfect place to start the discovery of the authentic regions of Auvergne and Limousin. Welcome to our cottage...and it's countryside. Sourniac is located on the high plains of Mauriac, at the North-Western limits of the Cantal. This part of Auvergne, very close to the Limousin, offers varied landscapes, moors, gorges, valleys, forests, and the famous (extinct!) volcanos, which it will be pleasant to you to discover in the course of your stay. It is an estate in perfect harmony with the nature where the envy for pure air and for freedom are fast filled thanks to its big spaces and in its grand panoramas. Numerous vestiges give evidence of the presence of the people on these lands for several centuries. The towns and villages in the surroundings will know how to seduce you by the charm of their centre, the quality of their reception and by the conviviality of the inhabitants. Go to the villages classified as ''most beautiful villages of France'' such as Salers where you will be charmed by the beauty of houses with stone roofs, surrounded by the majestic volcanoes of the ‘Monts du Cantal’. Don’t miss to visit one of the many castles such as Auzers, La Vigne, Anjony , La Tremolière ou Le Val. Between Dordogne and Massif Central, this estate with varied landscapes with a rich architectural heritage make the difference and privilege the escape and the green tourism.